A view of 300 South and Main Street in Salt Lake City in 1918. Photo courtesy of Ron Fox. Latter-day Saints traveled great distances to attend general conference in 1919. Technology has made viewing general conference easier than ever before. At promptly 10:00 a.m. on Sunday, June 1, 1919, President Heber J. Grant stepped to the pulpit of the Salt Lake Tabernacle and called the 89th Annual General Conference of The Church of Jesus Christ of Latter-day Saints to order. Following the music, a reverent solemn assembly commenced in which Church leaders and members sustained Heber J. Grant as the new president, filling the vacancy of President Joseph F. Smith, who passed away the previous November. In his first remarks as President of the Church, President Grant pledged to be a faithful servant. He also paid tribute to each preceding president and spoke of knowing each one personally except for Joseph Smith. He would go on to serve as Church President for the next 26 years. The sustaining of President Grant was just one of many interesting moments found in a look back at general conference 100 years ago. In 1919, Latter-day Saint families rode the train or drove their Model T automobiles and parked at Temple Square for free. If they didn’t get a seat in the Tabernacle, there were overflow sessions in the Assembly Hall and outside. There appeared to be no protesters. Along with singing by the Tabernacle Choir, there were many solos, duets, and other musical numbers performed. Church leaders spoke without teleprompters. Mission presidents were invited to speak. The annual statistical report included influenza deaths and the costs of two temples. There was no Church security, and everyone wanted to shake a Church leader’s hand. It’s also unclear how the public restrooms functioned at the time. With the help of the 1919 General Conference Report, the Deseret News archives, and insight from Christine R. Marin, an audiovisual archivist in the Church History Department, travel back in time and experience a taste of general conference 100 years ago. 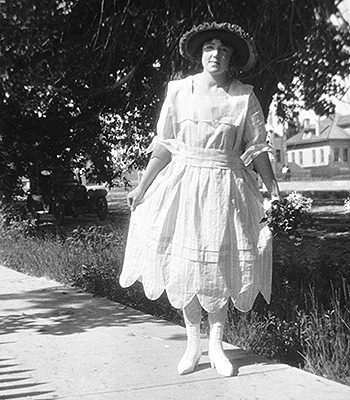 A young woman in 1918. Photo courtesy of Ron Fox. 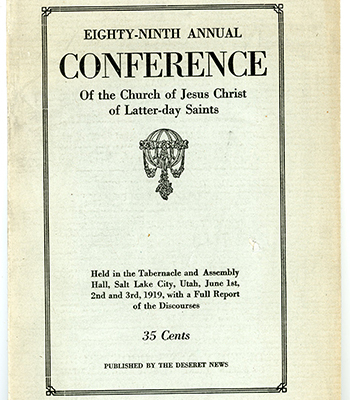 The cover of the 1919 general conference report. Photo courtesy of Ron Fox. A headline in the 1919 Deseret News. Screenshot from the Deseret News. 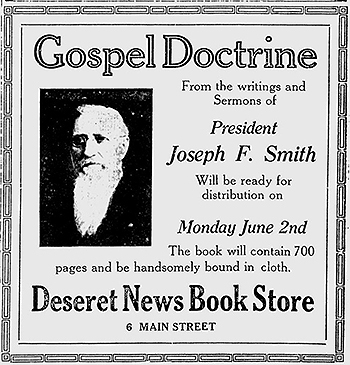 An advertisement in the 1919 Deseret News during the 89th Annual General Conference of The Church of Jesus Christ of Latter-day Saints. Deseret News screenshot. 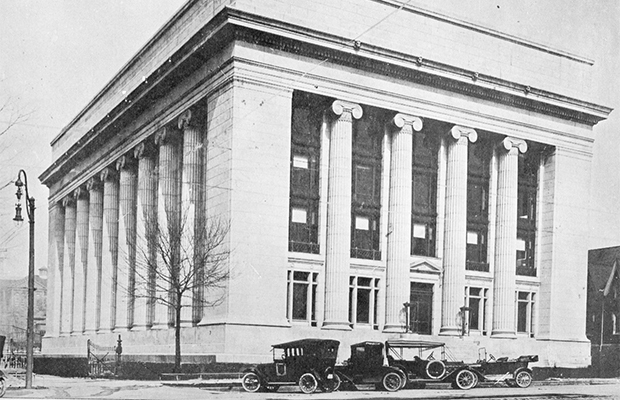 The 89th Annual General Conference was originally scheduled for April 4–6, 1919. But as people celebrated news of the Armistice on November 11, 1918, that ended fighting on land, sea, and air in World War I and soldiers began to demobilize, there was a resurgence of influenza. City officials placed quarantine signs on the front and rear doors of 2,000 homes struck by the flu in the Salt Lake area, which led Church leaders to delay the conference until June, Marin said. “Health was returning, the sun was coming out, and everything was right with the world,” Marin said about when conference took place in June. The First Presidency—Presidents Grant, Anthon H. Lund, and Charles W. Penrose—was present along with 10 members of the Quorum of the Twelve Apostles, namely Elders Rudger Clawson, George Albert Smith, Orson F. Whitney, David O. McKay, Anthony W. Ivins, Joseph Fielding Smith, James E. Talmage, Stephen L. Richards, Richard R. Lyman, and Melvin J. Ballard. Elder Reed Smoot was in Washington, D.C., and Elder George F. Richards was presiding over the British Mission. Also present were members of the First Council of the Seventy, mission presidents, stake presidents, patriarchs, bishops, and other men and women serving in different quorums and organizations of the Church. In addition to sustaining President Grant in the opening session, the conference was devoted to the memory of President Joseph F. Smith and the end of World War I. Many speakers delivered tender tributes to President Smith, Marin said. At 10:37 a.m. of the opening session, President Grant excused the First Council of the Seventy to head over to the Assembly Hall and conduct a separate meeting. Eight members of the Seventy spoke in this session, including Elder J. Golden Kimball and Elder B. H. Roberts. There was no coarse language used in Elder Kimball’s remarks. Music was provided by a Latter-day Saints University student choir under the direction of B. Cecil Gates. At 2:00 p.m. there were three more sessions: one in the Tabernacle, one in the Assembly Hall, and one outdoor meeting by the Bureau of Information building on Temple Square. Members of the Quorum of the Twelve Apostles and Presiding Bishopric spoke in these sessions. The overflow sessions only took place on Sunday. Sessions on Monday, June 2, and Tuesday, June 3, were held in the Tabernacle at 10:00 a.m. and 2:00 p.m. The reasoning behind the overflow sessions was to give more conferencegoers a chance to see Church leaders up close, Marin said. On Monday, June 2, President Grant shared the annual Church report for 1918. 14,761 baptisms and 15,963 children blessed. Of 5,752 deaths, 1,054 died of influenza and 862 died of pneumonia. More than 20,000 Latter-day Saints served in the U.S. military and its allies. Of this number, 383 died in the service. There was a “considerable” increase in the amount of tithes paid and it was well handled. Very little loss was incurred except for the failure to find a market for the large potato crop of 1917. The Hawaiian Temple, now practically complete, cost $200,000 (about $2.9 million today). The Cardston Alberta Temple, also nearing completion, will cost $600,000 when finished (about $8.8 million today). Sacrament meeting attendance dropped in 1918 due to quarantine and conditions prevailing during the epidemic of influenza. Another highlight of the June 2 morning session came when President Grant introduced newly called Elder Melvin J. Ballard, sustained the day before to fill the vacancy caused by President Smith’s death. Elder Ballard is the grandfather of President M. Russell Ballard, Acting President of the Quorum of the Twelve Apostles today. In his remarks, the newly called apostle repeated what he told President Grant when he was called. “President Grant, if I thought I could be worthy to be one of the special witnesses of the Lord Jesus Christ, it would be the happiest moment of my life; for I esteem that the highest honor that could come to man,” Elder Ballard said. Later in the conference, President Grant asked the junior apostle to sing a solo, “I'll Go Where You Want Me to Go,” which he did. Starting in Monday’s afternoon session and continuing into Tuesday, 15 mission presidents (with some “retiring” or being released) were invited to speak. All shared testimonies, missionary experiences, and gospel lessons, much like a returning missionary might today. President Charles A. Callis, president of the Southern States Mission and a future apostle, said, “God’s truth is marching on in the world” through the written word. At the conclusion of the conference, President Grant shared some letters he received. Another letter from a sister in the Church who did sign her name asked President Grant to say some kind words about the German people. There were no toilets in the Tabernacle in 1919, leaving the public restroom situation unclear. Marin said she has learned there were “dry toilets,” essentially a hole in the ground, on the west wall inside Temple Square around the turn of the century but nothing in the Tabernacle until years later. In reflecting on the events of the 1919 general conference, what stands out to Marin is how technology has made everything so accessible. But do we appreciate the opportunity to view general conference like those early Church members who traveled great distances just to sit in an overflow session? 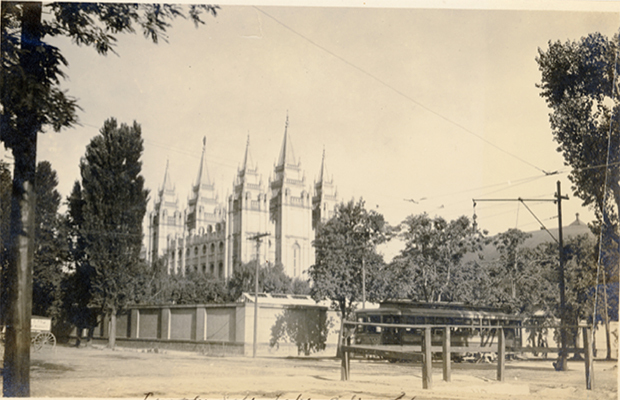 A view of the Salt Lake Temple in 1919. Photo courtesy of Ron Fox. The Church Administration Building in 1919. Photo courtesy of Ron Fox. 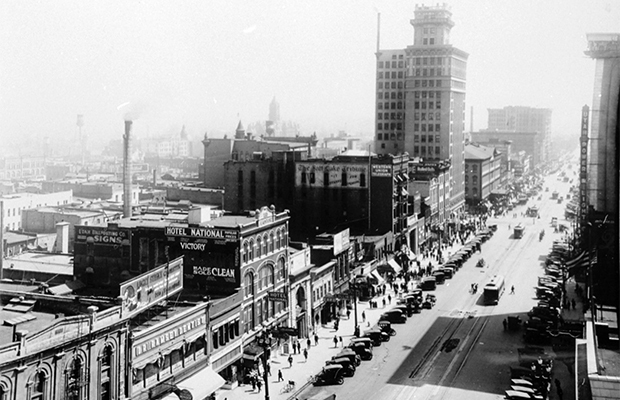 A view looking south from the old Deseret News building on Main Street in Salt Lake City in 1918. Photo courtesy of Ron Fox. 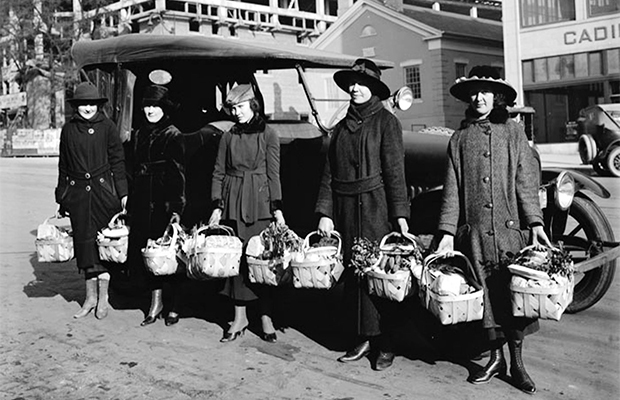 Women hold eight baskets of food on a Salt Lake City street in 1919. Photo courtesy of Ron Fox. Church President Heber J. 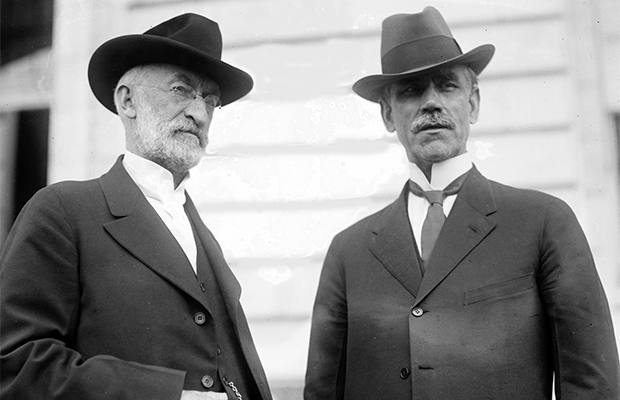 Grant and Utah Senator Reed Smoot outside the Senate Office Building in about 1907. 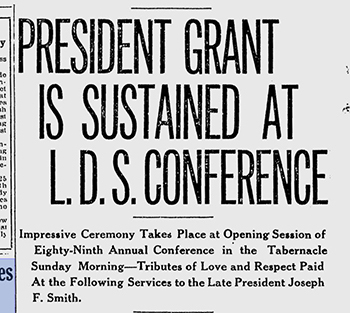 President Grant presided at general conference in June 1919. Deseret News archives. Crowds gather outside the temple walls in Salt Lake in 1919. This gathering was to honor the troops who came home from World War I. Photo by Sharon Pratt Wilbur, courtesy of Ron Fox.